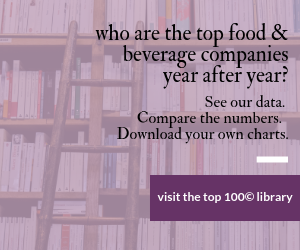 With 322 total mergers and acquisitions recorded in 2010, the food and beverage industry is seeing the highest M&A figure since 2008, and about even with the 2005 figure. The year 2010 began and ended with blockbuster deals. Kraft Foods Inc. engineered the two biggest mergers and acquisitions of 2010: acquiring Cadbury Plc (in a drama that played out through most of 2009), then helping to pay for that $19.4 billion purchase by selling its pizza business to Nestle SA for $3.7 billion. Both those sales closed in January of 2010. February saw suddenly acquisitive Diamond Foods get chip maker Kettle Foods, and Sunsweet acquire Herbal Water, maker of Ayala’s Herbal Water. Last summer, Snyder’s of Hanover Inc. merged with Lance Inc. Seneca Foods Corp. bought Unilink LLC and Lebanon Valley Cold Storage LP, both makers of frozen fruits and vegetables. In the fall, Ralcorp Holdings bought American Italian Pasta Co. And Cott Corp. got juice-maker Cliffstar Corp. TreeHouse Foods bought S.T. Specialty Foods. Smithfield Foods said it wanted all of Butterball LLC or nothing, but Maxwell Farms did not want to be bought out. So Maxwell bought Smithfield’s half of the turkey company and resold that share to Seaboard Corp.
And the year ended with two blockbusters: Bimbo Bakeries announced a deal to buy Sara Lee’s bakeries for $959 million, and Kohlberg Kravis Roberts & Co. and two other investment firms said they were taking Del Monte Foods private again. Both those deals closed in 2011. There were 322 total mergers and acquisitions recorded by The Food Institute in 2010, an increase of about 22 percent over 2009’s 264 recorded deals. That’s the highest figure since 2008, and about even with the 2005 figure. Gains were observed across all categories. As usual, food processors were the busiest, responsible for 77 acquisitions, approximately 33 percent more than they engineered in 2009. The largest increase was among multi-product processors. To purchase the Food Institute's "Food Business Mergers & Acquisitions 2010" publication, contact Sue Antista at sue.antista@foodinstitute.com or 201-791-5570 ext. 212, or visit www.foodinstitute.com/manda.cfm. The Food Institute takes a broad view of the "food industry," including in its tally brokers, consultants, packaging and equipment suppliers, restaurants and foodservice, retailers, and wholesalers and distributors. Not all those categories are shown in the table at right. Investment firms and banks were involved in 49 food industry deals, eight more than in 2009, demonstrating their access to more capital. Restaurants and foodservice operators accounted for 32 acquisitions, and retailers were involved in 38. "The across-the-board increase of mergers and acquisitions demonstrates the influence of an economic recovery, albeit a tempered improvement over 2009," the Food Institute report states. "Buyers tended to value a variety of assets and firms similarly rather than any isolated trends influencing one segment more than any other." The global market for mergers and acquisitions in 2010 totaled $2.4 trillion, a 22.9 percent increase from 2009 and the strongest full-year period for M&A since 2008, according to Thomson Reuters data cited by the Food Institute. "2010 marked the return of measured confidence for the investment banking industry," said Neil Masterson, global head of investment banking at Thomson Reuters. "While we are clearly still in a post-credit crunch environment, M&A and private equity firms are returning to robust deal activity, and investment banking fees are on the rise." Private equity-backed merger activity also returned to pre-2008 levels, reaching $225.4 billion during 2010. Additionally, global investment banking fees amounted to $84 billion over the year, increasing 9 percent over 2009, to become the biggest year for investment banking fees since 2007.